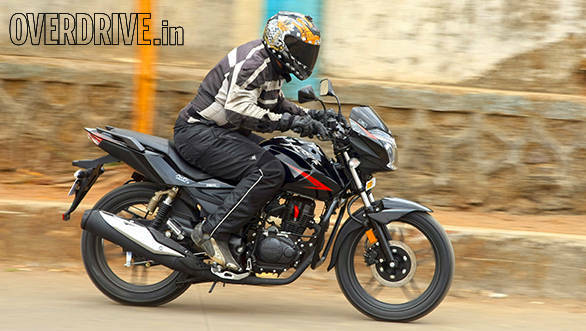 Hero re-entered the 150cc space (after creating it with the CBZ) with the CBZ X-Treme. The bike wore a Honda Unicorn-based engine. It proved to be a good 150, popular it wasn't. At least not by Hero's outsize standards at any rate. Now the new Xtreme is here. 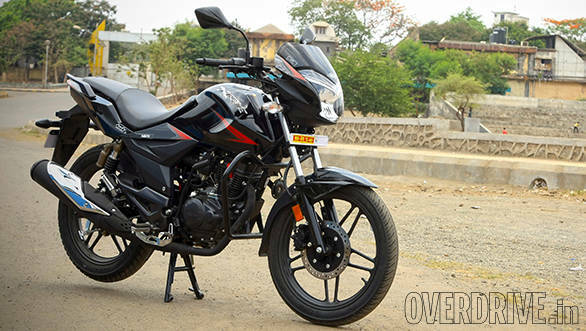 We have just ridden it and here's what you should know about Hero's new 150cc motorcycle. The original Xtreme wasn't a pretty motorcycle...? This one is better, that is for sure. It may not win a beauty pageant, but the Xtreme does stand out amongst the current crop of 150cc machines. The headlamp silhouette resembles the outgoing motorcycle to a certain extent, however Hero has made it sleeker. The pilot lamp is now positioned as an eyebrow. Departing from tradition, Hero has mounted the turn indicators on stalks rather than integrating them onto the bikini fairing. Hero has also done away with the engine cowl and tank extensions. The tank too has become sleeker and there are deep knee recesses as well. The chrome-like Xtreme badging is nicely integrated into the tank and Hero has done away with the CBZ nameplate. The mirrors are also not body coloured any more. Not quite done, Hero has also changed the exhaust shield of the new Xtreme though we feel this looks a bit bland. The tail lamp has been changed altogether but still is an all-LED unit. The indicators again have been moved from their regular position besides the tail lamp to the stalks. The pillion grab rails are split units, carried over from the CBZ Xtreme. Hero is on a features spree. Does the new Xtreme get any? Of course! The most obvious changes are the new digital-analogue meters. While the earlier Xtreme also had this combination, it was restricted to a digital speedo on the right, analogue tacho on the left and a small fuel gauge on the top. The new Xtreme though has a meter console largely dominated by a pleasant blue outlined rev counter, a side stand indicator just below it and then the digital console (speedo, fuel, trip and time information) flanked by the tell tale lights on either side. 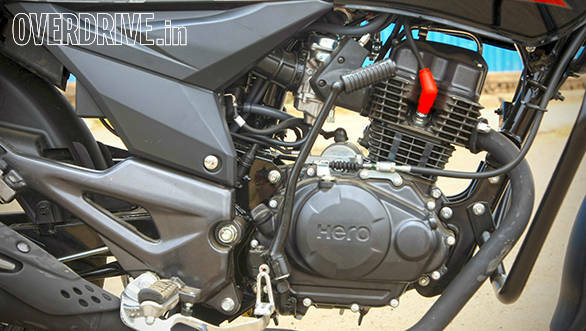 Hero has also added an engine immobilizer to the equation and also a service indicator. Another convenience feature is the key hole that stays lit all the time, and for one hour after you remove the key. This, Hero claims, will help you spot the bike in a crowded parking lot. Additionally if you lose the key, Hero urges you to get to the nearest authorized service centre to get a fresh set made. Is that all on the features front? No, there is another feature which we doubt will be of use to many. An underseat charging point has been provided in the new Xtreme. 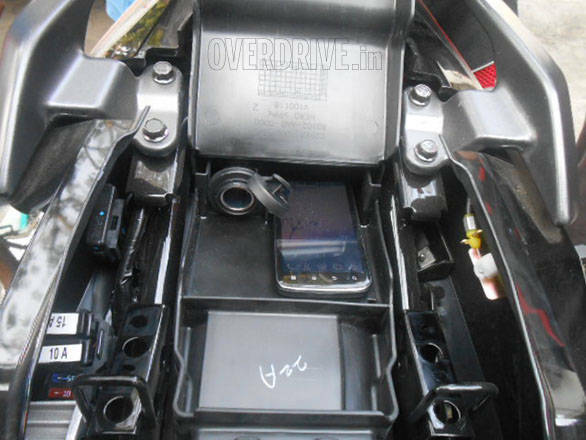 Having a safe, waterproof space to charge your mobile phone on a motorcycle is a good thing. However removing the seat every time to access the charge point is going to prove to be a hassle. Further, the real time when you do need a charge point is perhaps when on a long ride. At which point, chances are you'll have luggage on the bike which means unloading some or all of the stuff before you can get to the juice. The charge point is a good idea. But we wish Hero had gone all the way and provided a waterproof USB-style charge slot near the instruments. That would have been awesome. Is this a new engine? No. This is the tried and trusted 149.22cc Honda engine which has continued right from the time of the first CBZ Xtreme. It makes 14.4PS of power and 12.8Nm of torque. It is mated to a smooth shifting five-speed gearbox. 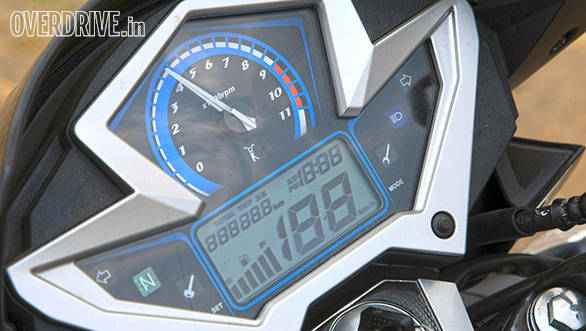 Hero did however show off a new Xtreme at the Expo which had a more powerful 15.2PS of power. We expect Hero to roll this version out at a later date, probably within this year. With the same kerb weight as the outgoing motorcycle (148kg) for the new one, expect a 0-60kmph time of 5.7s with a top speed of 112kmph. We also expect it to return about 57kmpl on our overall test cycle. The motorcycle is pretty brisk on the move like other 150cc machines from the manufacturer. Hero silently rolled out the 2014 Xtreme across all its showrooms in India. While as of now the only the front disc brake versions have arrived at dealerships, expect the ones with rear discs as well soon. The version we rode here retails for Rs 66,516 ex-Mumbai while an additional Rs 4,000 will get you the double disc variant. The new Xtreme is cheaper than the outgoing model by Rs 3,000. So, more features at a lesser price.